Ripley’s Believe It or Not! Times Square attracts a lot of visiting tourists, thanks to its high-traffic location on 42nd Street and global Ripley’s branding. But school holidays offer the chance to lure in locals, as city-bound (and often snowbound) parents plot things to occupy their kids over the school break. And trust us…it’s not easy getting New Yorkers interested in going anywhere NEAR Times Square. We took one President’s Week as a test case, to see how increased NYC-area media spotlight on a reason to come NOW would impact visitor count. A highly visual news hook was needed to tie “President’s Day” to “Ripley’s Believe It or Not,” and so on went our weird, wacky, and creative thinking caps. We crafted the idea to create an “unbelievable” sculpture of Mount Rushmore using unexpected, creative materials, and allow visitors to watch the sculptor bring the piece to life right in the lobby of Ripley’s over President’s Day Weekend. As food-themed events have proven successful for Ripley’s in the past, we did extensive (and fun) research into US artists who specialize in culinary sculptures, such as chocolate, butter, and fruit. 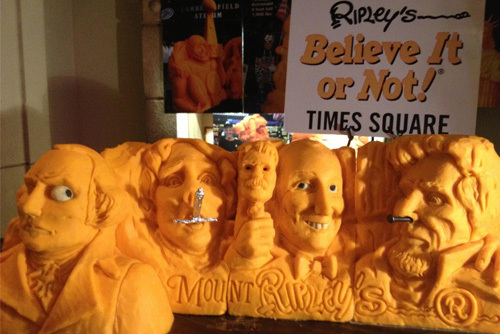 Our research found The Cheese Lady, Wisconsin-born former dairy farmer Sarah Kaufmann, who agreed to carve Mount Rushmore (with a Ripley’s twist) into a 160-lb, 6-foot long solid block of cheddar cheese. She is a “Master Cheese Sculptor” (believe it), who creates cheese sculptures as a full-time career. We worked with her to design the sketches for a Ripley’s-themed Mount Rushmore (a spike driven up Lincoln’s nose, Roosevelt as a shrunken head, etc.) to ensure maximum Ripley’s branding. We also tapped our friends at Cabot Creamery to donate the massive cheese block and provide tasting samples in exchange for PR and onsite branding. The result? The visitor count over that President’s Day Weekend was the highest holiday weekend total ever achieved since the attraction opened its doors in 2007. And it was all due to the PR coverage: the event was featured as a “Hot Pick” in the New York Post, including an extensive interview with Sarah, and selected as a “Critics’ Pick of the Week” in both the print and online editions of Time Out New York. Other coverage included TV segments on NBC TODAY Weekend, MSNBC, and WPIX-TV, radio segments (which aired multiple times) on 1010 WINS-AM, WCBS-AM 880 News, WBBR-AM Bloomberg Radio, and online coverage including Time Out New York Kids, Big Apple Parent, New York Family, City Guide New York, Cheap Eats, and many more, including a Reuters syndicated photo.